Depends on the load cell load rating, wrap angle, direction of force, etc. It’s more a function of the load cells. They both have their advantages, and disadvantages. Load cell control supplies a load cell feedback signal. You always know what tension is doing. With dancer controllers you don’t, unless you use our Z4 Dancer Controller. Dancers are good for applications where you need storage to make your product. Open loop is good for start/stop applications. The web runs for a second, or two, stops for a function (die cutter), and then runs again. Closed loop controllers don’t work well with this type of application. 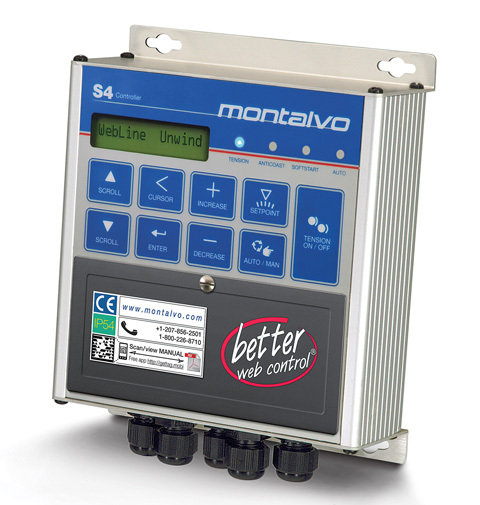 Montalvo features the U4 Open Loop Diameter Based Tension Controller for these applications. Is digital better than analog? They are both good. Analog is real time, digital will have a scan speed, so if you need to react to extremely fast changes, analog is better. Can I use this controller with strain gauge, and foil gauge load cells? Do I need to tell you a meter scale when I order this controller? Is this controller just like the S3100, or S3110? Except that it doesn’t have an analog meter, and you can remotely turn tension on, and off. Can I get one with an analog meter? If I adjusted R2/Out Zero and now my brake doesn’t relax, how do adjust it to zero? 1. Turn tension off on the controller. 3. Place your voltmeter on terminals 15 and 17 for S-3100 or 19 and 20 for the S4 (This is a 0-10V control output). 4. If the volt meter is not reading (0 Volts), then you need to adjust the outzero/R2 until output is truly zero (0 Volts). Once. Or if you change load cells, or controller boards. How do I know if my controller or machine is malfunctioning? How do I know what meter scale I need? You need to know your web width, and about how many PLI you will be running. Make sure that the tension max. and min. will be in the center of the meter scale. How do I calibrate this controller? Follow the calibration procedure in the S4 Manual.